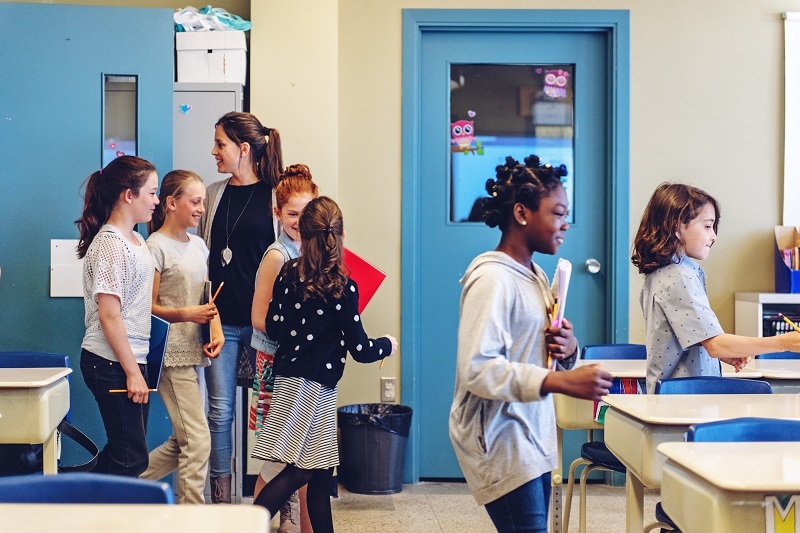 If you can spare a few minutes to observe other teachers, the chances are very good that one positive outcome will be an appreciation for the way well-planned procedures can make any class run smoothly. Processes and procedures work at any grade level because when students know what is expected of them, they tend to proceed with confidence and focus. Students will know what to do when confronted with various classroom tasks, so they won’t waste valuable time waiting for you to repeat directions. Start of class. Stand at the door and greet students as they enter the room. This will give you time to check the emotional weather of your class and to connect with your students. This is also a good time to give students handouts or to have them pick up the papers for the day’s work. If you have a designated place for students to park their cellphones, they should stow them away at this time. Students should then proceed directly to their seats and begin their warmup activity. Ideally, you will have this activity posted for them in a prominent place. End of class. Your goal is to make sure students have just enough time to pack up and tidy their work areas without congregating around the doorway or misbehaving. Allow the last two minutes of class for students to pack their belongings and clean their work areas. (Allow more time if you teach art or a similar class where students need to put away equipment.) To streamline the process, have some students assume various responsibilities such as tossing trash, putting materials away, and making sure everyone in their area has their belongings. Some teachers have found that it’s effective to set a timer to sound near the end of class so that students know they will have plenty of time to pack up and get ready for dismissal. One way to make sure the end of class is orderly is to have students remain at their desks until you dismiss them. This works especially well when teachers acknowledge that students are restless and anxious about leaving on time and take care to release them in a timely fashion. Turning in work to be graded. Your goals here are to ensure that every paper is turned in and that students have put their names on their work. Designate an area in the front of the room where you can oversee students turning in their work. Many teachers use clearly labeled bins to collect papers before moving them to folders for grading. To ensure that students have put their names on their papers, provide highlighters and ask students to highlight their names on their papers before turning them in. You can also consider assigning students a roster number that they can write beside their name on their papers. A quick check of the numbers can make it easy to see who has turned in work. Some teachers also make it easy for students who are not turning in work on time by speaking to them about it in advance. Finishing work early. Because students work at varying speeds, it’s difficult to pace instruction to make sure that everyone is engaged in learning for the entire class period. It’s important to make sure students know what they are expected to do once they finish an assignment. Effective procedures for this will vary according to grade level or subject matter, but many teachers have found that having students work on an ongoing project or other anchor activity is productive. Others provide students with checklists or choice boards of possible activities. These can be adjusted for individual students or posted for all students to follow. Taking attendance. The biggest mistake some new teachers make is to waste valuable time each day by taking a tedious roll call. It’s easy to avoid this when you consider that the goals for taking attendance should be that it occurs without fail and that it does not interfere with instruction. The easiest procedure to ensure this is to have students in assigned places at the start of class so that you can just glance around the room to see who’s present and who is not. This is a far better use of instructional time than a roll call. If you have been able to stand at the door to greet students as they enter class, then you will find it even easier and quicker to take attendance without a roll call. After receiving a B.A. in English from Virginia Tech, Julia Thompson spent 40 years teaching in Arizona, North Carolina and Virginia. Recently retired, Thompson works for the Bureau of Education & Research conducting seminars geared to help teachers support difficult and challenging students. Author of several books for teachers, Thompson's most recent book, the fourth edition of The First-Year Teacher's Survival Guide, was published in May 2018.Thompson also provides advice on a variety of subjects through her website, www.juliagthompson.com; on her blog, juliagthompson.blogspot.com; and on Twitter at @TeacherAdvice.